Maybe you want to be a millionaire. Maybe you want to be financially independent. Perhaps it is saving enough money so you can retire. Maybe it is some other amount. Whatever your definition is, there are two basic steps to help get you there. These two simple steps will make almost anybody richer! Is that a let down? Notice the title wasn’t called “Getting Rich in Two Quick Steps.” If you were hoping to hear some brand new idea on how to get rich quick in two steps, you’ve come to the wrong page. These steps will take longer, but whatever your definition of rich means, these two steps will likely get you there. Sure there are get rich schemes that succeed in making people rich. The thing is – the people getting rich by these are normally the ones who are running them, not you! So let’s talk about the two steps that work for almost anybody! There are a lot of different ways that you can take these two steps. With the first step, saving money comes down to spending less than you make. For most people, this is entirely possible. To save more, you need to cut your expenses. Alternatively, you can increase your income more than your expenses increase. Investing is not quite as simplistic because there are more ways you can invest. You can invest in starting a business. This is risky because a lot of businesses fail. However, businesses can be very successful with the catch that you’ll have to invest time as well as money. I can’t give much insight into this area because I don’t have much experience. What I can say though is that you probably shouldn’t follow the advice of somebody who tells you that (insert business opportunity here) will make you millions quickly. You can also invest in education. Simply investing in education won’t help you get rich. You’ll need to invest in an education that will increase your income at a new job or in your current job. The key is that you’ll need to balance how much more you will make with how much the education costs. If it wasn’t clear enough before, increasing your income doesn’t matter on the road to being rich if your expenses rise just as much. Lastly, you can invest in the stock market, bonds, and/or other things that appreciate in value (commodities, real estate, etc.). Investing in stocks and bonds is my preferred method because I can use mutual funds to invest in a lot of different companies, reducing risk. These may not always pay off in the short term, but are nearly sure to in the long term. As a word of advice, I’d recommend that you focus on the long term with a diverse portfolio because it is less risky. You certainly can get rich by picking individual stocks, but it is by no means guaranteed. 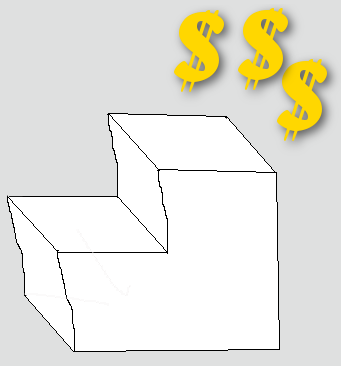 You’re actually going to bounce between these two stairs quite a bit for a long time because continuing to invest money requires you to continue saving money. Remember – money acts like money – you need to save more and invest it to have more. Hopefully you’re ready for an aerobic workout because it will pay off in the end!